LivePlan removes the tedious work of business planning, so you can focus on teaching what really matters. Students really take to the hands–on application of LivePlan. LivePlan is receiving rave reviews. The students very much appreciate the guidance that the program offers. From a very lean, pitch-style plan to a lender-ready traditional business plan, LivePlan will ensure your students can express their ideas and understand all the critical aspects of their business. LivePlan&apos;s financial forecasting tools ensure students can focus on the numbers and strategic thinking. Each student&apos;s LivePlan account can be shared with others, so your classroom can include group work, mentoring, and easy grading with minimal effort. 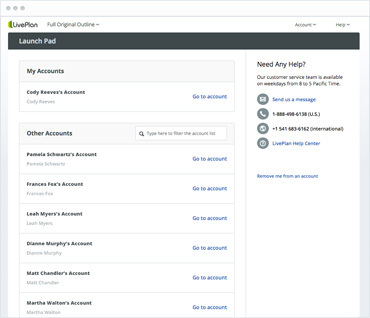 LivePlan uses a step–by–step approach with instructions and examples included. Students can focus on one thing at a time, without distractions. And, students can use our free phone, chat, and email support for any software questions they have. You teach business and strategy, not Excel and Word. 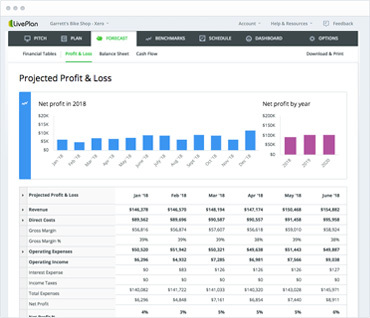 LivePlan lets your students focus exclusively on business strategy and financial forecasting, so you can teach them to think critically about their business concepts, and not get hung up on Excel and Word documents. LivePlan business plans are impressive, complete, and accurate. 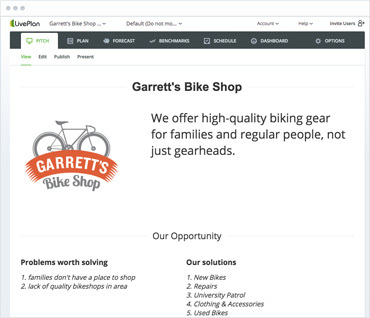 Students can easily export a pitch deck presentation from LivePlan, share a one–page executive summary, and share plans in a format that has won hundreds of business plan competitions. If you want to offer a business planning course either online or in–person, check out our “Start, Run & Grow Your Business” turn–key curriculum. It&apos;s included when you add LivePlan to your advising processes. Fill out the form below and we&apos;ll contact you shortly with information on academic pricing and how to start your evaluation. If you&apos;d like to speak to someone about LivePlan, call us at (888) 498-6136. Our customer service hours are Monday to Friday, 8am to 5pm Pacific Time. Thanks! An educator advocate will be contacting you shortly to set up your free LivePlan account. LivePlan is receiving rave reviews. The students very much appreciate the guidance that the program offers. I love the ability to act as a contributor to their plans. The help resources are phenomenal and easy to navigate. Instructors looking for a great tool to help students develop business plans need to look at Live Plan. The step by step process walks students through the entire process from Pitch to Financials. As the Instructor you can also have online access to their plan and provide feed back and comments as the plan develops. At the beginning of this course, I just had an idea. Throughout just a short 6 weeks, that idea blossomed into a usable concept thanks to this class. LivePlan transformed my business, and really made us think critically in the breakdown of how it would run. Prior to using LivePlan, I provided students with a Word document template for their business plan. Even though I encouraged students to use a collaboration tool such as Google Groups, many did not. They were emailing the plan back and forth between each other and it was difficult to keep track of versions and changes. LivePlan really facilitated communication between students who were in a team on the business plan project. Students could comment on sections of their business plan and collaborate on what to change in their plan without having to meet face–to–face. Students really take to the hands–on application of LivePlan. Because LivePlan and the “Start, Run & Grow Your Business” curriculum are straightforward and easily grasped by students of all skill levels, students can focus on researching their own business concepts and fully develop their own business plans. Before using LivePlan, students sometimes were intimidated by the business planning process. LivePlan breaks it down into manageable steps and takes the mystery out of developing a business plan.